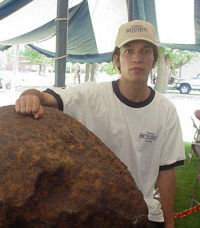 Mark Bostick, 32 a Wichita, Kansas native, started collecting meteorites in 2001. Within a few months he was a staff writer for Voyage Meteorite and Space Events Magazine. In 2002 he joined the online publication, Meteorite Times and regularly submits articles for publication. Mark has also published articles in Meteorite Magazine and Photo Astronomy eZine. Mark was a consultant and helped produce the first legal tender coin minted with a meteorite. He led a letter drive for the U.S. Postal service to make a meteorite related stamp in 2004. Mark is probably best know to his colleagues as a meteorite historian having collected over 10,000 newspaper accounts and has documented several meteorite recovery stories. Mark is the co-founder of the Kansas Meteorite Society and has an excelley online meteorite resource site, www.meteoritearticles.com.